China, the world's second-largest economy, has set its growth target at about 7% for this year, the government said. 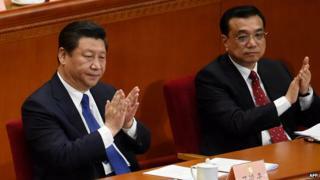 The announcement was made by Premier Li Keqiang at the start of the National People's Congress on Thursday. The target is lower than 7.5% set last year, which was missed after China grew at its slowest pace in 24 years. The new target is in line with China's plan to guide the economy towards slower and more sustainable growth. Premier Li also said the government would have a consumer inflation target at about 3%, down from 3.5% in 2014. The country's annual inflation hit a five-year low in January of 0.8% - below expectations of a 1% rise. Factory deflation also worsened - highlighting persistent weakness in the economy. Mr Li said that the economy would face greater difficulties this year, compared to the previous one. Over the weekend, China cut interest rates for the second time in three months to boost lending and growth in the economy. The government also pledged to rein in local government debt and deepen reforms of state-owned businesses. It aims to create 10 million jobs and keep the urban unemployment rate at 4.5% or below. In an attempt to push for financial reforms, Mr Li announced that a trial of a trading link between its Shenzhen and Hong Kong stock markets would be launched at an "appropriate time". The move comes after a link between the Shanghai and Hong Kong stock exchanges was established in November - allowing investors to trade stocks on both exchanges.